JoeCon 2013 Set Revealed - Page 6- BLOOD FOR THE BARON!!! Just to let everyone know the Club's second wave of Oktober Guard figures are showing up. Perhaps prices will come down now. I got a set for a friend. He may want to sell the Iron Grenadiers. I got the full boxed set today from my friend in the US so I'm happy. Re. Charbroil: I never understood why G.I. Joe has so many flame-thrower troopers on the team (4 at last count). If I recall right, the U.S. military officially discontinued the use of flame throwers in 1978 ( 4 years before the G.I. Joe team even existed), due to the controversy of cruelty, and the fact that snipers made short work of them. 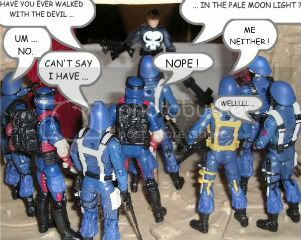 Now, Cobra and the Red Shadows using them -- that I understand!